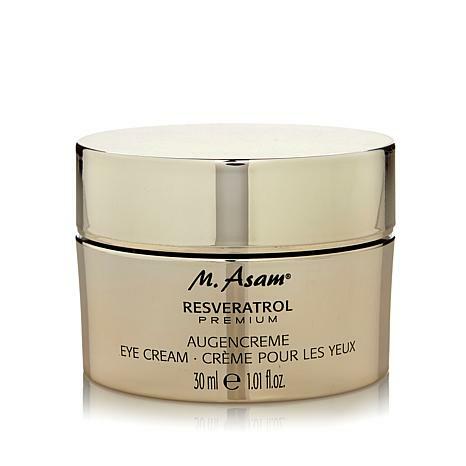 Fragrance-free, age-defying eye cream based on resveratrol, a powerful antioxidant. 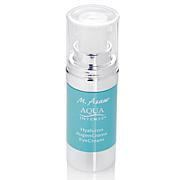 Gently pat onto cleansed skin around the eye area in the morning and evening. Contains key ingredients such as shea butter, OPC, hyaluronic acid, grape seed oil, propolis, chamomile, Vitamins E and C, and panthenol. 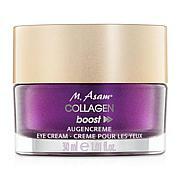 The beige color of the cream results from the brown ingredients OPC and resveratrol. Ingredients: Aqua (Water), Methylpropanediol, Caprylic/Capric Triglyceride, Glycerin, Hydrogenated Vegetable Oil, C10-18 Triglycerides, Dicaprylyl Carbonate, Glyceryl Stearate Citrate, Ricinus Communis (Castor) Seed Oil, Glyceryl Stearate, Butylene Glycol, Cetearyl Alcohol, Vitis Vinifera (Grape) Seed Oil, Butyrospermum Parkii (Shea) Butter, Dipentaerythrityl Pentaisononanoate, Sodium Stearoyl Glutamate, Magnolia Biondii Bark Extract, Vitis Vinifera (Grape) Vine Extract, Salix Alba (Willow) Bark Extract, Vitis Vinifera (Grape) Seed Extract, Citrus Grandis (Grapefruit) Fruit Extract, Propolis Extract, Chamomilla Recutita (Matricaria) Flower/Leaf Extract, Thujopsis Dolabrata Branch Extract, Camellia Sinensis Leaf Extract, Inulin, Panthenol, Tocopherol, Sodium Hyaluronate, Tocopheryl Acetate, Ascorbyl Tetraisopalmitate, Diisopropyl Adipate, Ubiquinone, Lecithin, Glyceryl Undecylenate, Acrylates/C10-30 Alkyl Acrylate Crosspolymer, Sodium Polyacrylate, 1,2-Hexanediol, Caprylyl Glycol, Disodium EDTA, Alcohol. Ive tried them all and so glad I tried this one. Youll love it! Cool & Refreshing - Love It! I'm sure it will last a long time, just takes a small amount and absorbs immediately. 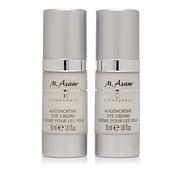 I am sure this eye cream is wonderful, but I find it very thick and difficult to apply? Bought approx 7 products based on the presentation a couple weeks ago. I really wanted to love this line. Used for 8 days and giving another two weeks. I have not noticed any difference in my skin. Did not completely absorb in skin. Have changed my application amount and amount of time after cleaning face. Slight itchiness around eyes. Not sure if that is similar to the only other reviewer's experience. Wish that I could come back and modify my review if things change. 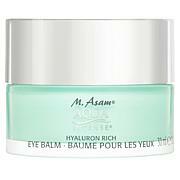 after using this for a week, my eyes began to sting and upon waking up in the morning they were a bit puffy. It was extremely heavy.